Searchin g the entire genome, a Yale research team has identified a gene that when eliminated can spur regeneration of axons in nerve cells severed by spinal cord injury. 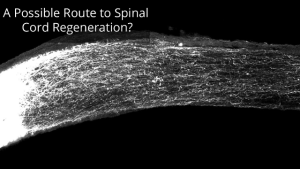 The Yale team found more than 580 different genes that may play a role in regeneration of axons in nerve cells, something that rarely occurs in adult mammals but is of vital interest to scientists hoping to repair injuries to the central nervous system. Intriguingly, said the researchers, about one in 10 of those came from a family of genes involved in transport of information within cells. The researchers also reported that eliminating one of those genes, Rab27, led to regeneration of axons in the optic nerve or spinal cord of mice. The work was primarily funded by the National Institutes of Health. Yale’s Yuichi Sekine is lead author of the paper.